As you're placing your home on the market, consider a surefire way to sell your house: careful home staging. Some positive aspects of home staging include fewer days on the market and better offers. If your goal is to sell your house quickly, and at the highest possible price, choose a well thought out approach to home staging. No one "lives" in their house as they do when it's on the market. As soon as I sign a listing agreement with a Seller, I say "This property is no longer your home, but your temporary residence until a Buyer is found, and you close on this home and move into your new home." I find this helps the Seller to start separating from the home, reducing the emotions from the process. The less emotions involved, the more realistic the Seller will be in all aspects of the selling process, which will help in all aspects of the sale. Staging truly "sets the stage for receiving and negotiating offers and ultimately closing. The more diligent you are at getting and keeping this property looking like a model home, the quicker you'll be on your way to your new home. Staging is not decorating. Decorating is geared to the current owner's taste and usually involves bringing new furniture and accessories into the house. Staging is mostly about removing unnecessary furniture and accessories so a potential buyer can see what they're actually buying, the space, and not be distracted by the seller's belongings. So use this time as a chance to get things, not immediately needed, boxed up and put in storage and out of the house. This will be a head start on the moving process and will actually help sellers separate from the property and get thinking toward their new home. I usually find once the seller is into selling mode, the property moves more quickly and smoothly. 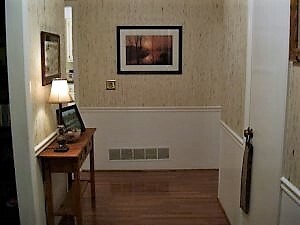 Below are some pictures from a previous home that was staged and immediately sold. This owner actually had too little furnishings and I had to bring things in to warm it up. 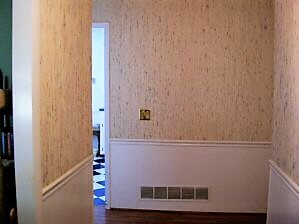 The picture at the back wall pulls the eye into the house.This​ hallway makes the first impression of the home and it's cold & empty. We've added a narrow hall table with lamp, which always warms the space. The picture at the back wall pulls the eye into the house. The hallway is not inviting at all. It's very blank. The picture at the right causes the eye to move forward to the mirror at the end of the hall, with all doors open. This is much more inviting. ​Adding the warmth of a lamp and some additional furniture and items to better define the space. Cou​nters covered by personal items. ​Personal items are in a basket under the sink and the warmth of a small lamp ads the peaceful, spa-like appeal of the bath. Curb appeal is your only chance to make a strong first impression on buyers before they walk into your house. The pluses and minuses that jump out at buyers shape their first opinion of your home and how you keep up your home's regular maintenance. Understanding this assists us in determining what measures we can take to draw buyers from the street and into your house. If your house isn't pretty on the outside with refreshed paint and colorful garden plants we'll need to tackle those as well. Refer to the Curb Appeal Checklist and add dollars to your house's final selling price. Does your home seem to say, "This is Your New Home" to a buyer? Looking through your house from a buyer's view, I'll suggest arrangements that enhance sales appeal. I'll advise you reduce the effect of anything that gives the illusion of clutter. Surface areas like tables, desks and counters should be clutter-free. Kitschy sculptures, sentimental items, family photos, and kids' drawings should get moved out of sight. You need to "generalize" the home so buyers can imagine it as their new home. Potential buyers want to see a property that charms them. Items that could be too personal should be removed in order for your home to have likability during any visit. In every opportunity, we want to engage the buyer's senses. Brightening up your interior is critical, so we'll do things like part the curtains and create light where needed to show off your property. Together we'll enhance the air of the house with enjoyable music playing softly and make sure a nice aroma flows throughout your home. We'll incorporate cozy-looking bedspreads, and pillows on your chairs and bed. We want buyers to feel like your house is their future home. Using my home staging tips could get your house sold more quickly in Wilkesboro. Homes of Wilkes can help you create an inviting feeling that makes buyers want to stay — permanently. Give me a call at 336-984-0226 and I'll make sure your house is $taged to $ell.